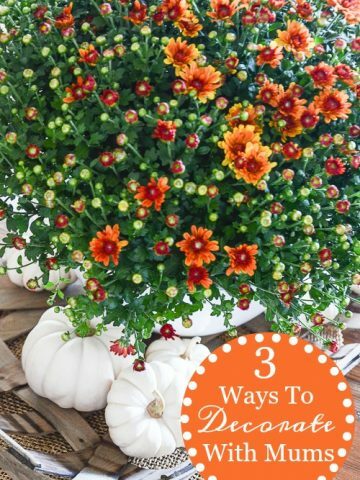 Mums are spectacular fall plants that can be brought indoors and used for decorating. Caring for mums indoors is easy and with only a few tips you can keep a mum plant healthy for three to four weeks. They are a big bang for your buck as they are less expensive than most bouquets of flowers. 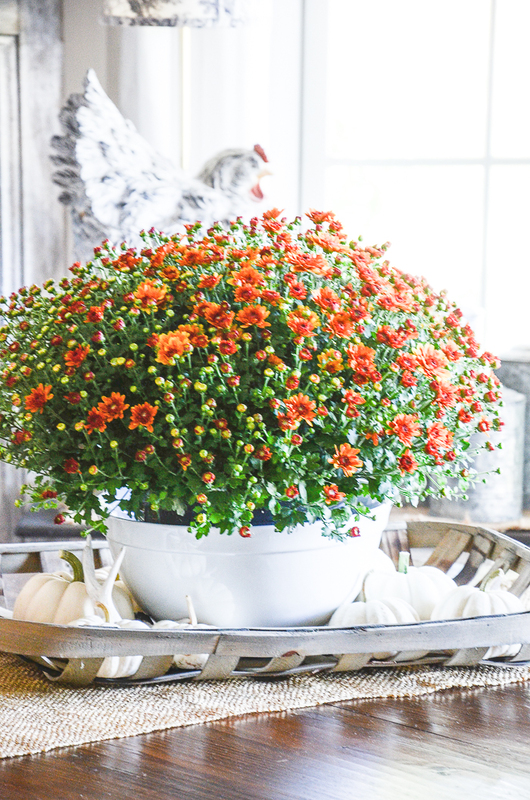 Let’s talk about taking care of mums indoors! 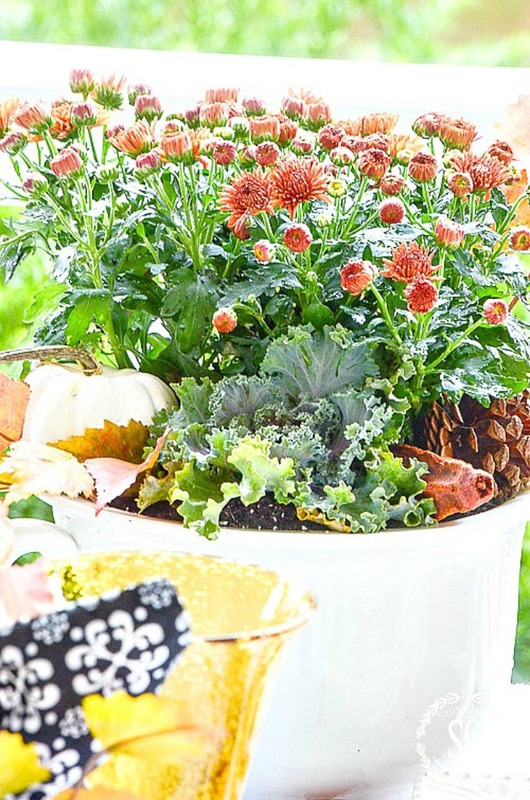 Now, let’s bring those pretty mums indoors! It’s best to think of mums as a long-lasting cut flower. They are a fabulous, bushy, lush plant with tons of pretty colorful blooms and can easily stand alone as decor. 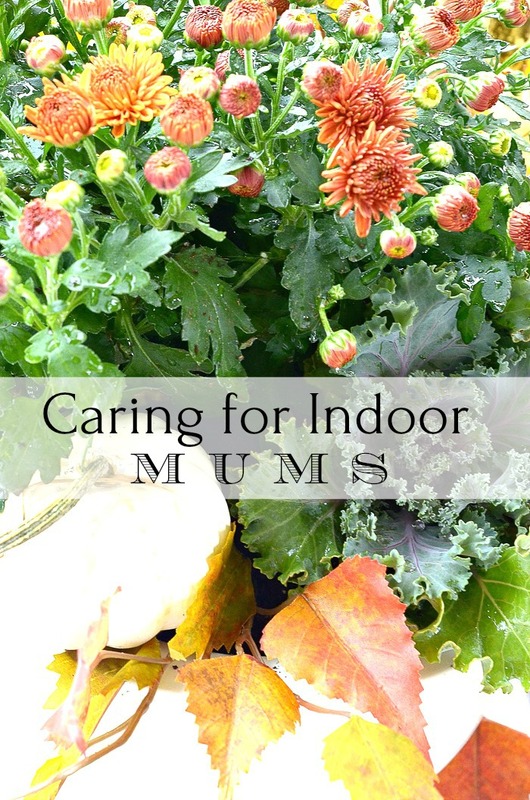 Caring for mums indoors is easier than you might think! Mum’s like water. Keeping them hydrated keeps them happy. They will wilt quickly. Check them every day and when the top 1 inch of soil is dry or they look the least bit droopy give them a big drink. Water the base of the mums and try not to let the water hit the leaves or blooms. If they are in a continer make sure there is no standing water in the container. Mums usually come in black plastic containers. You can keep mums right in those containers if they are not too pot bound but please put them into another pretty container! Collect container that you can use for mums and other containers. I have a large urn and a couple champagne buckets that I use every year. And I also have a few white containers, one is made to hold ice and bottled drinks. It’s my favorite! If a mum is pot bound it is a good idea to repot it. Use a good quality potting soil and give the roots a little “fluffing” and put the mum in a container bigger than the original pot. This will actually help them live longer. And a little extra tip… mums look amazing when grouped with other fall elements like baby boo pumpkins, leaves, pinecones or planted alongside ornamental cabbage! 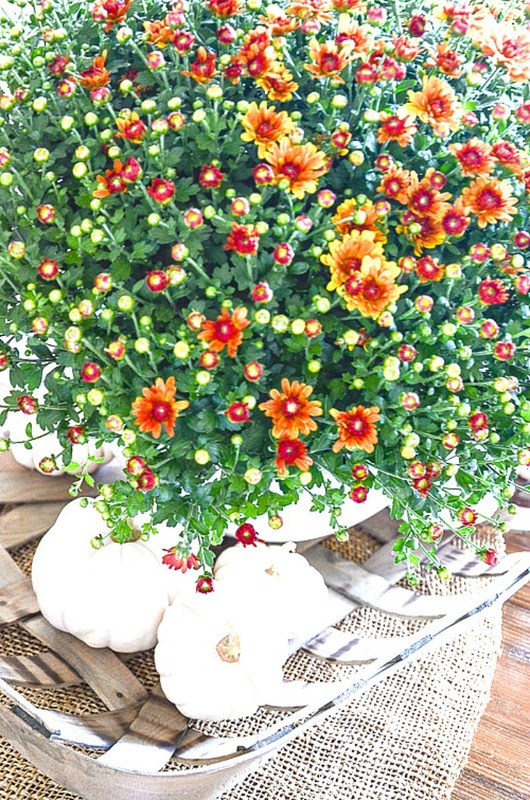 I often plant indoor mums and add lots of fall elements to them. Mums love the sun! 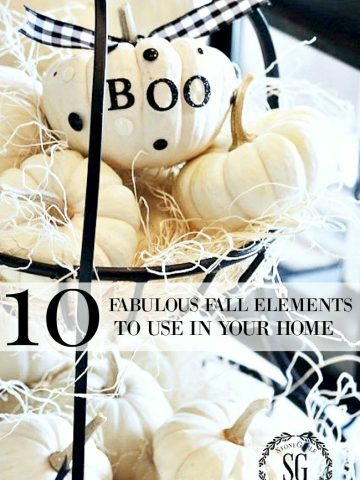 So put them in a spot in your home where they are getting lots of light. I have a mum on my family room coffee table and it does not get much sun so I take it outside every few days so it can enjoy not only the outdoor sun but the weather too. If you buy mums in the bud stage you will need to expose them to sunlight for them to bloom. I actually like getting mums in the early stages of flowering because the blooms will last longer. If you have cool nights where you live let your mum have a night outside every now and then. They get fatigued in warm temperatures. As blooms become spent remember to deadhead your mums. This keeps them not only looking pretty but also encourages new buds to bloom. 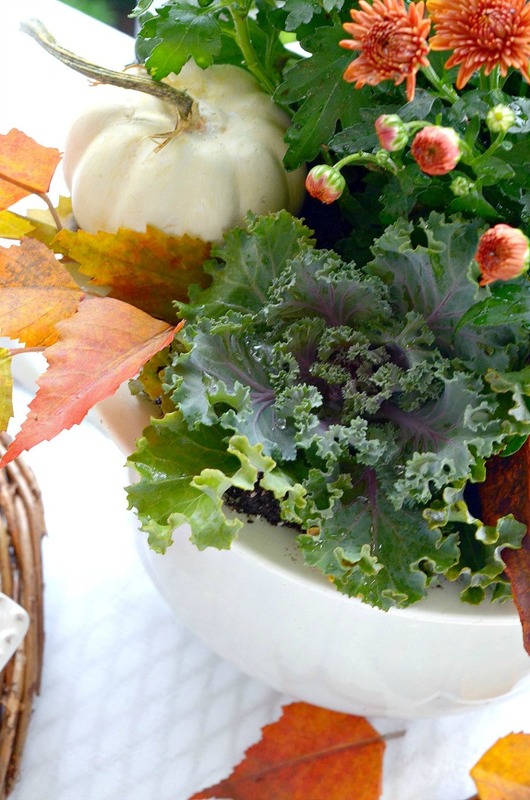 Snip or pinch off the spent flowers right above the next set of leaves. You should also take off dead leaves so they don’t spread any disease to the rest of the plant. With this simple care, a mum should flower and look nice for about a month. When they are done throw them away. And replace them with a new mum. You can try to replant them but they usually are not very successful transplanted from the indoors. Because they are so economical I look at them as long-lasting cut flowers and feel no guilt saying “thank you for your beauty” and getting rid of them. 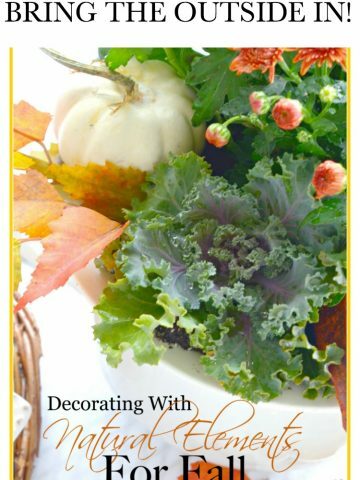 I hope you will find a space in your home for these quintessential fall plants now you know about caring for mums indoors! What is your favorite color mum? Can you tell my favorites? Thank you! 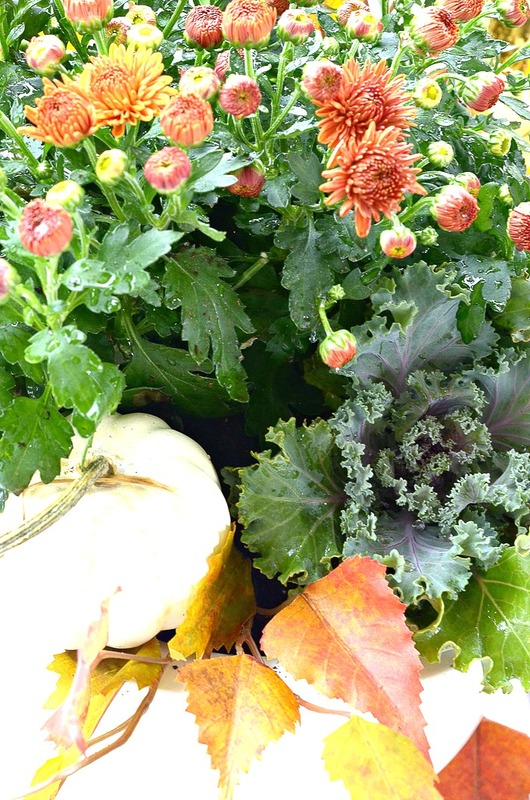 I love using mums inside this time of year, but your reminders are great! I have two in a basket in my dining room, nestled in some pumpkin colored shredded “stuff”withal few little gourds. Makes this 90 degree S.C. weather seem a little “fallish”. I like thinking of them as long lasting cut flowers and not being discouraged when they don’t live long lives. Thanks! So beautiful. I may try a pot in my white soup tureen on the sideboard. Thanks for the another fun idea. Perfect timing with today’s podcast! 😉 I love the fiery coral mums! I plan on getting one or two for my wee porch! 🙂 Thanks for the tips… I’ve been just deadheading the actual flower head. I’m gonna try clipping at the leaves! Such timely tips on Mums, we placed three in our dining room just this week. I will follow your advice! Great tips! I am actually trying a few mums indoors this year. Right now, there are in my dining room which doesn’t get a lot of light. I might move them or maybe just take them outside every few days. I don’t exactly have a green thumb so I appreciate all your tips! Enjoy your weekend! I take my mums out every now and then and it seems to revive them. I have always loved mums whether in my garden or on the front porch with pumpkins and gourds.. Until recently I always was drawn toward bright yellow ones but the last few years have bought the tawny orange .So pretty in my black urns flanking the front door. A little hack: Buy a couple of less than perfect mums and cut of the blooms for inside arrangements.long lasting and you can save some money. LOVE your hack, Kathy! Thanks for sharing!